A full Paper, in English language as a .doc file, typed and edited strictly in accordance with the paper guidelines, already included in the provided Paper Template. Each paper must not exceed 8 pages in A4 format including figures, photographs, tables, references etc..
A short Curriculum Vitae of the Corresponding Author (who is going to present the paper at the Conference) (maximum 200 words), based on the provided CV Template. Submission is possible through the online form available below. 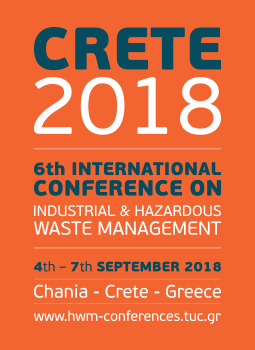 Submission of your Full Paper equals acceptance of the CRETE 2018 Terms and Conditions. Both full Paper and extended Abstract will be included in the Conference Proceedings (electronic and/or printed). Copyright of full Paper, extended Abstract, as well as PowerPoint presentations provided during the Conference are assigned to IWWG (International Waste Working Group), for the sole purpose of publication (.pdf form) on the IWWG website . Please note that the receipt of all Papers will be confirmed. Authors not receiving an e-mail notifying receipt of their Paper should check with the Secretariat. Please avoid double submission. If you need to update your Paper please contact the Organizing Secretariat.